An effort is underway to preserve the historic Pennsylvania Railroad signal tower located at 501 E. Main St. in Bradford. BRADFORD — An effort is underway to preserve the historic Pennsylvania Railroad signal tower located at 501 E. Main St. in Bradford. The signal, or switching, tower was similar to a traffic control tower at an airport, according to Kosier. 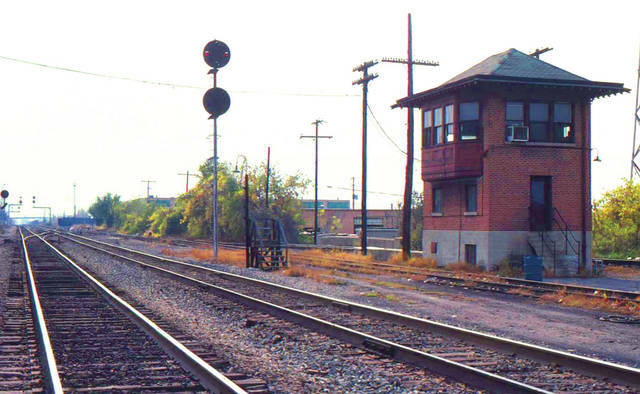 Personnel manning the tower would communicate with the train dispatcher and give orders to the crews of trains passing through the Bradford railroad junction. The tower was built by the Philadelphia-based Pennsylvania Railroad in about 1929 and served as the eastern terminus of a now-defunct rail line running from Bradford to Indianapolis. Called the Richmond and Covington Railroad, this line intersected with another abandoned route running from Columbus to Chicago. The tower housed steel throw-arms, called Armstrong levers, which were operated by hand by those manning the tower. The tower operator would get the instructions for the movement of trains through the junction and position the signals and switches for those movements. The tower was closed Jan. 3, 1984. A combination of grants from the State of Ohio and the Ohio Humanities Council will help preserve the tower. The Ohio Humanities Council grant will help to develop a Cultural Heritage Tourism Destination at the BF Tower. “The museum is very grateful for this support,” Kosier said. Kosier’s father, Herbert Kosier, always thought Bradford could use a railroad museum. Kosier spoke in more depth about the importance of the railroad operation to Bradford’s community and history. The Railroad Museum will hold a quarter auction in November, and veterans will be admitted free Nov. 10. A new program called the North Pole Express will take place Dec. 8 in which children visiting the museum will be greeted and have their ticket punched by the conductor, enjoy hot cocoa and cookies served by the porters and get to see Santa. This entry was tagged BF Tower, Bradford, Bradford Railroad Museum, Ohio Humanities Council, Railroad. Bookmark the permalink.